Johns Hopkins biomedical engineering undergraduates developed a quick-dissolving film that may someday deliver rotavirus vaccine to infants in impoverished areas. 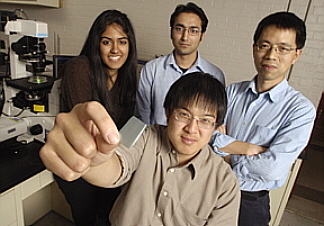 Co-team leader Christopher Yu holds a sample of the material. Behind him are team member Dhanya Rangaraj, co-team leader Rohan Agrawal and Hai-Quan Mao, the team's faculty advisor. As envisioned by the design team, a small piece of this film would stick to and then dissolve quickly on an infant's tongue, causing the child to swallow the rotavirus vaccine. Unlike liquid formulas of rotavirus vaccine, the thin film would not need to be kept cool. This would reduce storage and distribution costs in developing nations. Christopher Yu, co-leader of the student design team. Color images of the device and the researchers available; contact Phil Sneiderman.